This was a mish mash of weather, but it was nice for us when it counted. Gary went off to do a day's gardening in Sterring. We messed around for most of the morning and then set off to find him. On the way the rain was quite heavy, but stopped just as we arrived. 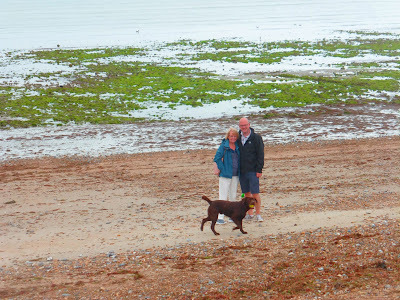 We looked around the grounds of the fabulous houses where he works, then left him to it as we took Roan and Jackson for a long walk along and on the beach. Once again it was brought home what a magnet Jackson is. I can't imagine that we would have a fraction of the conversations with complete strangers if we didn't have a beautiful, friendly dark brown labrador. Ferring is a small village on the south coast, in West Sussex. As seaside holidays grew in popularity, Ferring grew as a haven of peace whilst the likes of Brighton and Hove burgeoned and accommodated large influxes of visitors. 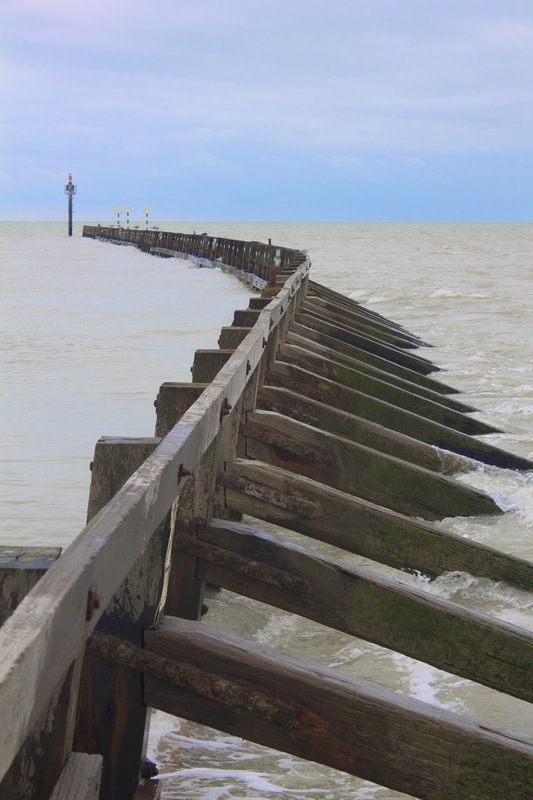 Today it is hard to see where Worthing ends and Ferring begins. We were down at millionaires row along the sea front. 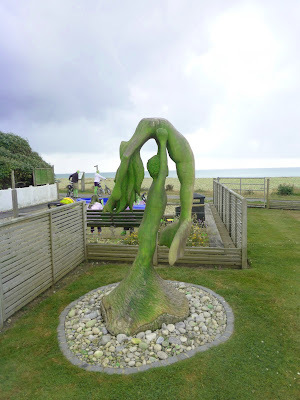 Gary is a well respected gardener and he is responsible for three of the houses that all have long, wide gardens running to the top of the beach. 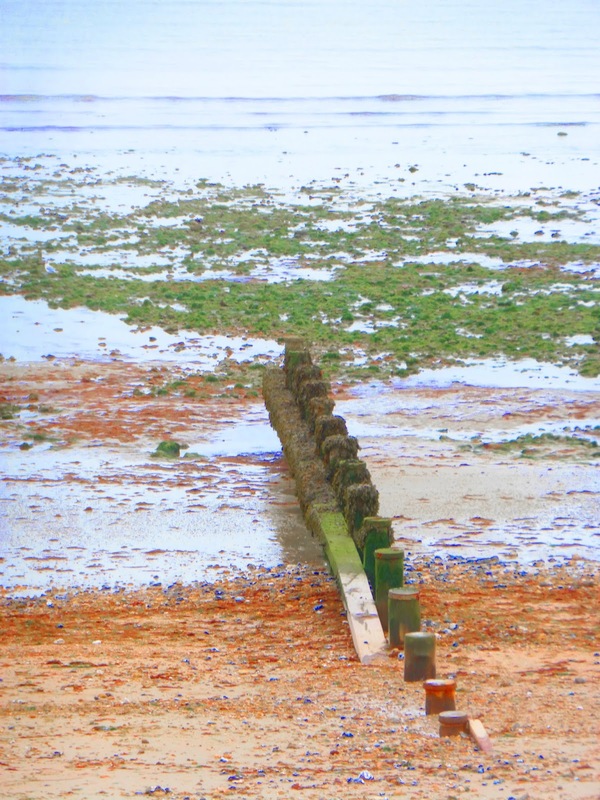 The beach at Ferring is stony and divided by groynes, but when the tide is out there are great swathes of sand. 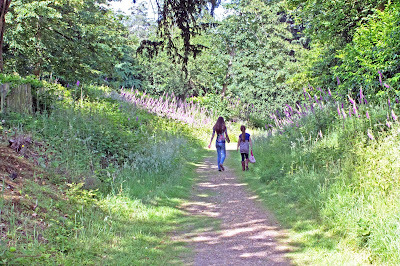 Whilst beautiful and a magnet for anyone walking a dog, this area is not overcrowded. There is a long strip of sward that separates the beach from the houses, most of which are to dream about. We drove to Ferring from Brighton in very heavy rain. It stopped as we did. We found the beach and the sun came out. 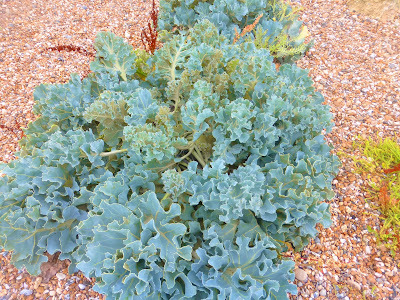 We walked as far as we could, to wear Roan and Jackson out, then found a sea front cafe as the rain came back. Shortly afterwards to sun was as hot as you could hope. mermad - 38, 26 and 75p a kilo. For the first half of my life we rarely went north of the Midlands, and so it was about 35 years ago I discovered the loveliness of Abbots Bromley. 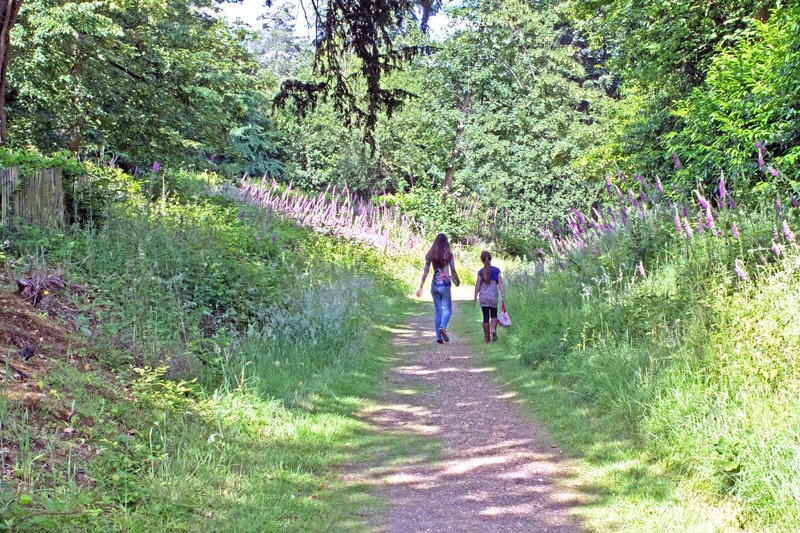 This town of under 2000 people is only 13 miles north of Lichfield, but the nicest journey through the Staffordshire countryside, which takes you over the middle of Blithfield Reservoir, is just over 15 miles. My first involvement was when we started the Lichfield Talking News for the Blind 35 years ago and I was asked to visit the prestigious Abbots Bromley School for Girls. 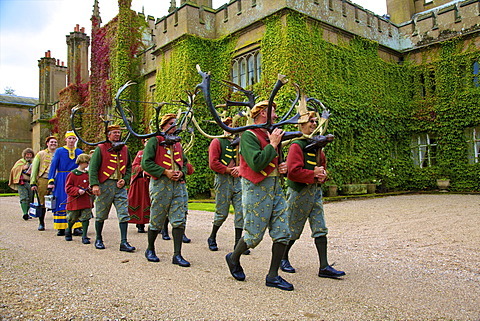 It was whilst I was there that I was reminded that there is the annual Horn Dance. The first recorded mention of Abbots Bromley (under an ancient name) was in 942, and it is recorded in the Domesday Book. 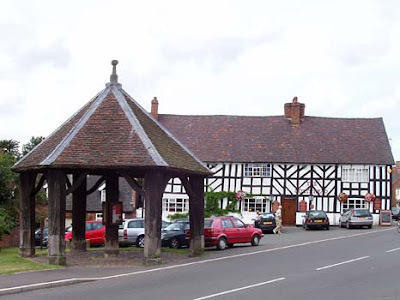 In common with my home town of Coleshill in Warwickshire, the town failed to develop because the railway never reached there, and so it sat in a backwater and remains largely unspoiled. 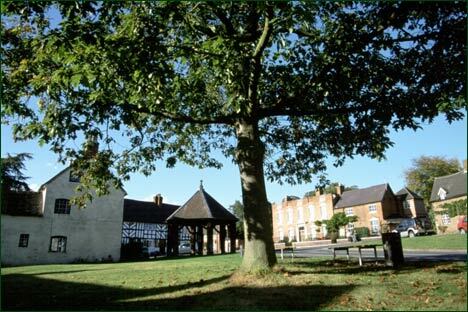 It has twice been voted the best place to live in the Midlands and always ranks high in the annual Best Kept Village competition. It wasn;t our fastest get away. I took everything to the Sorting Office and Pauline pacled, but we had to wait for Wiltshire Farm Foods to deliver for Rita. We took enough dinners to see her through the week and then headed south. We stayed at Wycombe for an hour and had lunch with Helen & Dave. Then it was my turn. The M25 was slow, but it took just two hours. So, five hours in all. Reece had gone off on a Cub Scout camp. Gary and Roan and Jackson the labrador were welcoming and Dan got home at 6pm, so we had a restful, convivial night. 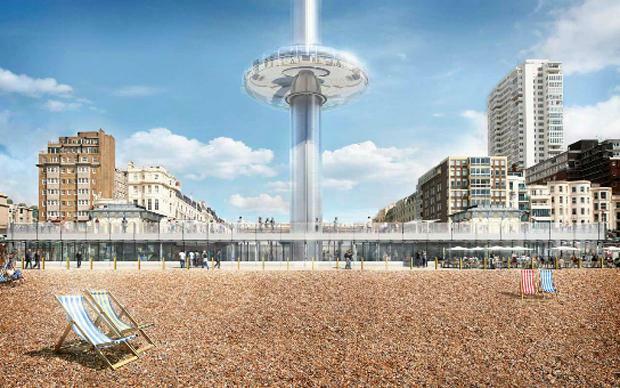 The only main change since our last trip down was the addition to the skyline of the i360, which opens to thrill the public in the next few days. 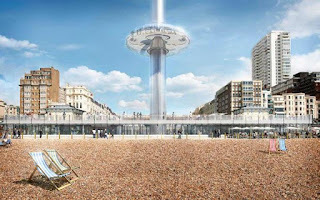 We will have to wait until another trip and better weather to get the most out of this 150 metre high tower that you ascend in a giant pod before doing a 360, laying out all of Brighton and the South Downs below you. 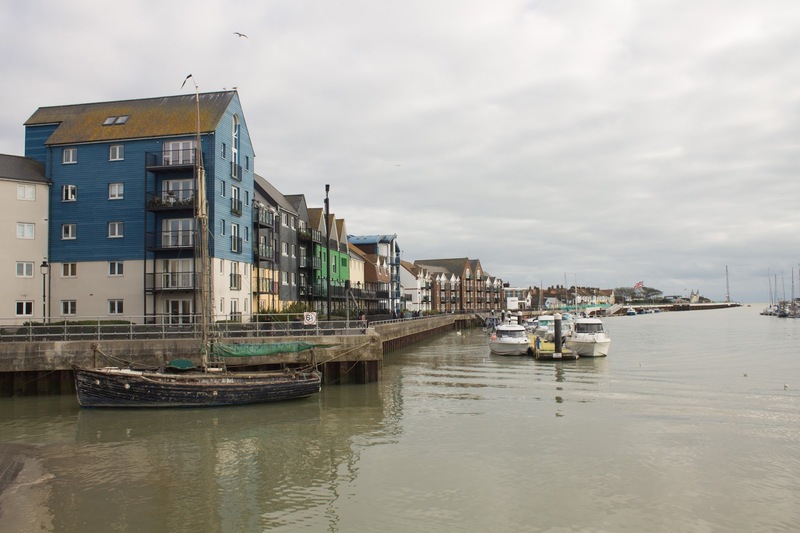 The Arun is a river in West Sussex that I know from two points - Arundel, where it runs past the shadow of the castle, and Littlehampton, where it meets the sea. Arundel must be subject to a more detailed description, but down at Littlehampton there is more variety. Just back from the sea front is the 'Look and See' centre. On the opposite bank is a useful stroll that leads to a watering hole just above the beach where you can sit and watch the small boats going in or out, and people watch to your hearts content. This was just another Thursday. Grey, much cooler and my hands still hurting, but the worst is over already. I answered my e-mails and then recorded the Stevenage Talking News. I gave the listeners a bit more than usual, but was finished by noon. Then there were five media players to wrap and label for despatch tomorrow. I did the Live at Home run, went into the studio and duplicated everything for Stevenage, South Wales and Scotland, but didn't try to put any in envelopes because that is where I get problems when my hands are bad. The envelopes are Velcro sealed and I end up with fingers bleeding. There isn't much to say about Lower Slaughter, except it is a delight to visit. 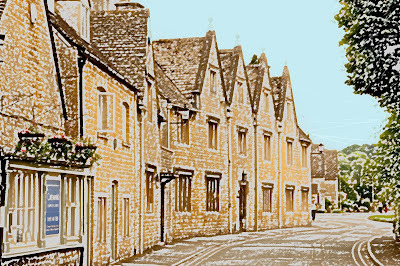 Our journeys from the Midlands down to Bourton on the Water always took us through Stow on the Wold, and we would see signs indicating the Slaughters, but never went there until Volkswagen took us for a two day stay. We stayed at the atmospheric The Manors Hotel, and our main purpose for being there was to learn about the latest new car, but we saw enough of both villages to want to go back. For our 40th wedding anniversary our family took over a farm near the area and we spent a brilliant weekend being social and exploring the taste of wines from around the world, but we also got out to see the surroundings. 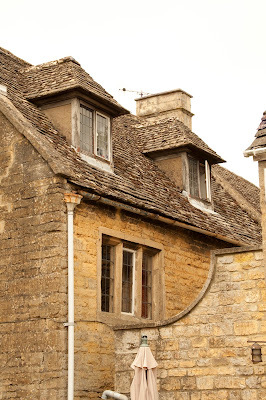 We were lucky when we got to Lower Slaughter because sunshine brings out the best of the honey-coloured Cotswold stone. 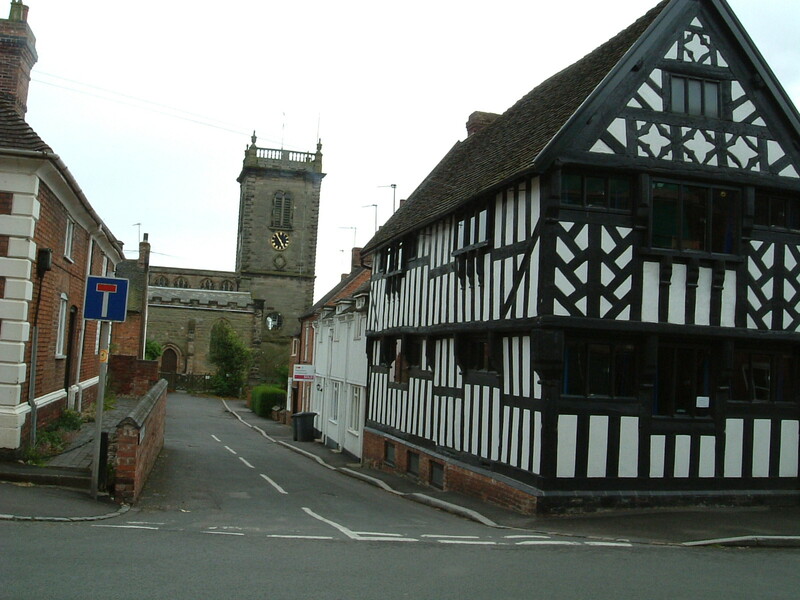 Most of the houses in the village were built in the 16th and 17th centuries. The mill looks incongruous, being built out of red bricks, but there is enough charm everywhere else for you to forgive that anomaly. 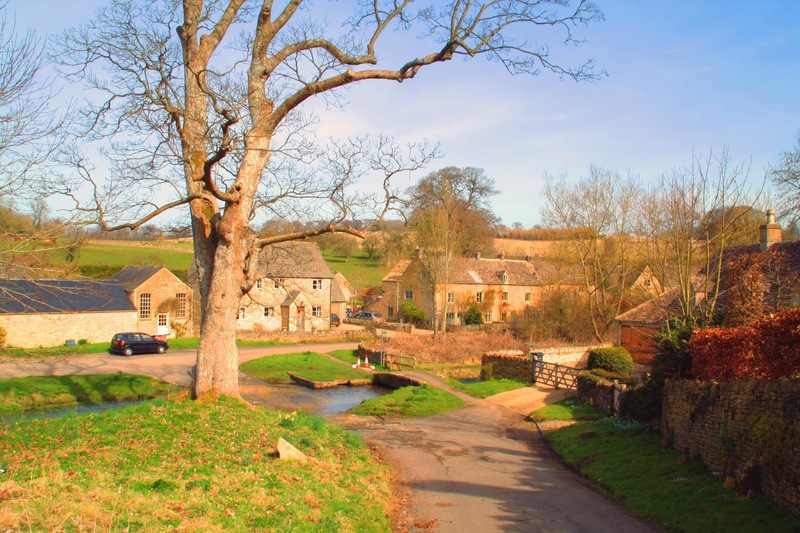 The village sits on both sides of the River Eye. I decided I wouldn't give in to my hands today. Pauline had other ideas. I strapped myself to the computer and started downloading all of the news for Scotland and Wales. Then I processed three new listeners. I went downstairs to make us both a coffee and heard a noise from the dining room. Pauline had sneaked out, gone to the Sorting Office and was sat on the carpet processing six sacks of returns. I did do some of it when her back was turned, but she did 90%. After lunch we walked into Lichfield, mainly for stationery for the Talking News. Later I took everything to the studio for tonight's team, and that was it. I won't get away with this for long. On the Treasure Hunt on Sunday, someone said "Why did they do that to him for hearsay?" We gently pointed out that the word was heresy. 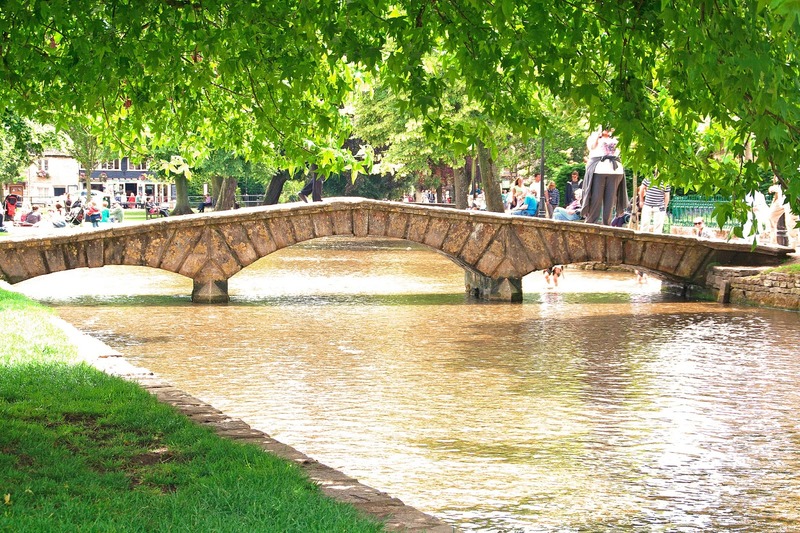 Bourton on the Water is one of the jewels of the lovely Cotswolds. 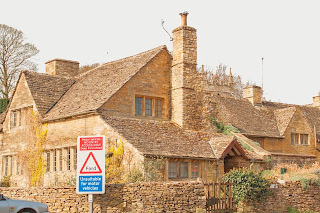 It was the first place I ever visited in the Cotswolds, on a school trip back in the early 1950s. 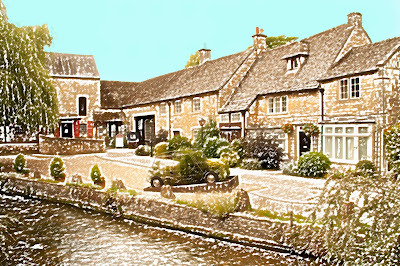 All that I can remember of that trip, apart from the lovely honey-coloured buildings and the shallow river Windrush that bobbles along the length of the High Street, was the model village, which was created in 1937 and is still a favourite attraction today. It seemed to me, as I was growing up, that if anyone suggested a trip to the Cotswolds we would invariably end up at Bourton, even though we had to pass through the length of the area of outstanding natural beauty to get to it. There was a comedy programme on the radio called Much Binding in the Marsh. This was broadcast from 1944 to 1954 and I rarely missed an episode. The Marsh was Moreton in the Marsh, and it awakened my interest in the area. 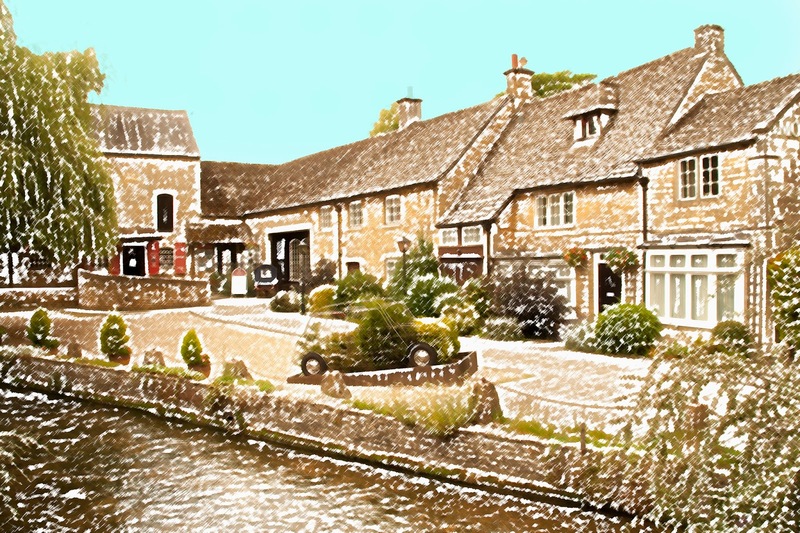 It seemed that Bourton grew every time we visited. Not in population so much as in attractions. I visited in the early 1960s and found Birdland. Going back in the 1990s I couldn't find it. It had moved to a much better location and now is firmly established with more than 500 different birds living happily on the site. 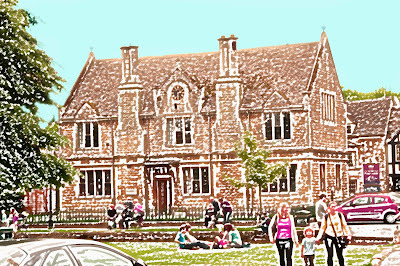 Other attractions that found life as the years have passed included the Cotswold Motor Museum, and the intriguing Dragonfly Maze. This opened in 1997 and is a maze with a difference. You need to be able to answer clues as well as have a sense of direction. It's five years since our last visit. Time for another. One of the quirks of my personality is that I tend to remember only the good things that happen to me, and either expunge or at least partially banish the bad. So I'd forgotten what a bad attack of gluten can be like. I imagine (and hope) that today will be my worst. With a couple of hundred blisters on both hands (and just a few on my left foot) my fingers were so swollen that I couldn't make a fist. But it was the constant itching that got to me, so I experimented and found I could use two fingertips - one on each hand - so I spent the day on my list of places seen or to be seen and made up my computer listing. This list is making me realise how blessed and privileged I've been. Most of the special places that I've been to have been at the expense of others - mostly motor manufacturers. I've not just visited, I've slept in castles, dined in Prince Rainier's palace, stayed in hotels that cost more for one night than I would spend on a week's holiday - including flights. I am getting only good memories from this list, which is currently at 1359 places, and still growing. Meanwhile Pauline was left to do everything that should have been down to me, so I've got some making up to do in a few days time - though she did manage over three hours at Ventura Park with Gill! 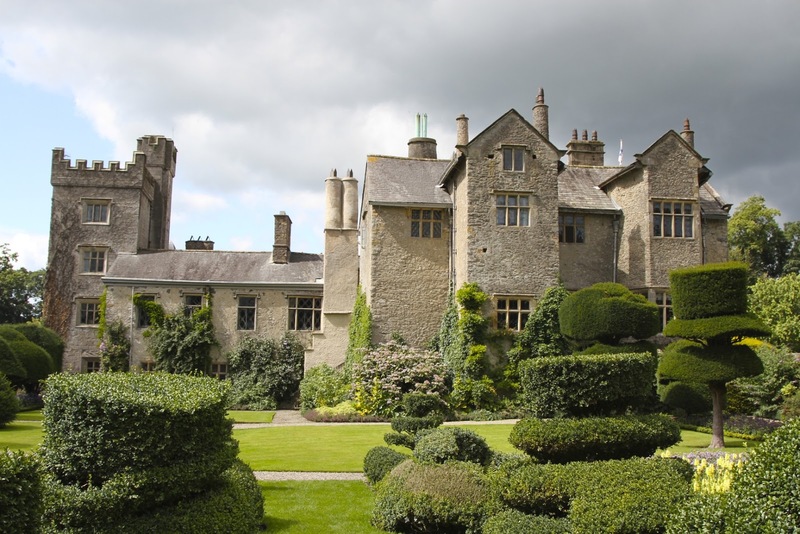 Levens Hall is situated in the Kent Valley of beautiful Cumbria at LA8 0PD. 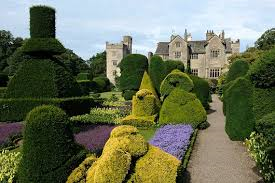 It is an Elizabethan house that is interesting in its own right, but may be more famous for its gardens. 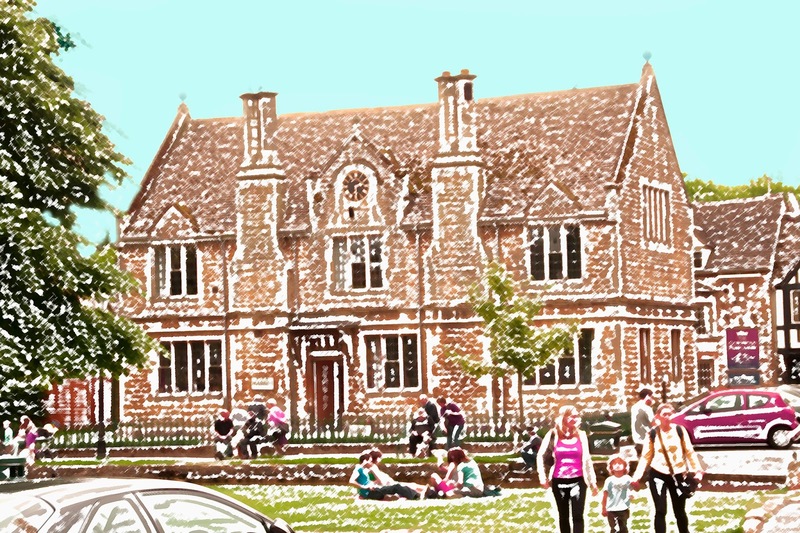 There was a house on the site as early as 1350. A family named Bellingham took over the estae and began building the Elizabethan house, although this has been extended and altered several times over the next couple of centuries in particular, especially when it passed into the ownership of James Grahme. The main changes were made in 1689 but there were further alterations from time to time. The house is known for its interior decorations, including fine panelling, artistic plasterwork and its classic furnishings. The gorgeous gardens were started by Monsieur Beaumont in 1684 and he laid the foundations for the topiary. 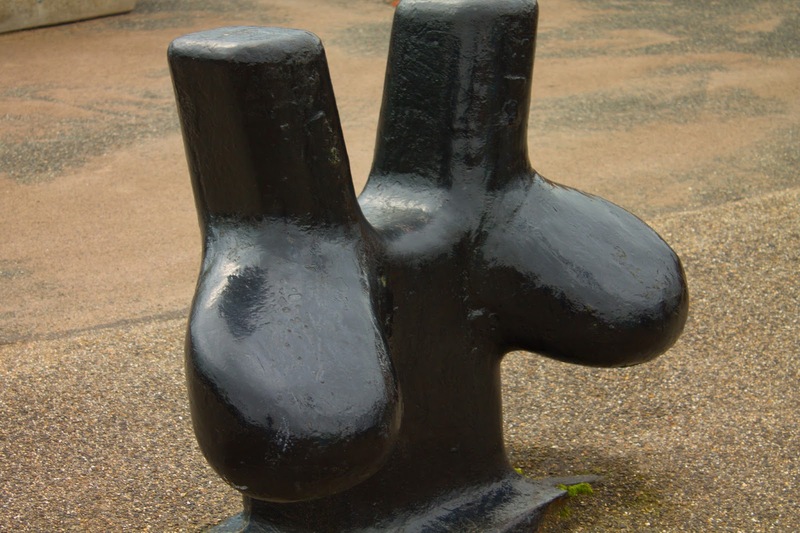 As they grew they became irreplaceable, but they are not the only attractions. 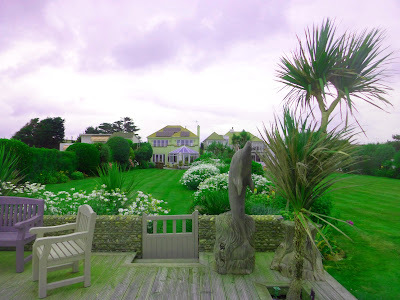 The flower beds and borders well reflect the passage of the years, making this a place that can be visited several times and you will always see something different. I was up early and took our Auris for an MOT. It passed. What I learned, however, was the mile I had to drive was enough with my hands in their current state. Too many people dismiss gluten intolerance as a myth - an excuse to exclude something that someone doesn't like from their diet. They couldn't be more wrong. I firmly believe that my problem comes from the chemicals that are put on our crops, wheat especially, so I have to avoid wheat at any cost. However, there is a question mark over barley, rye and oats. I've allowed myself odd invasions by each and got away with it, but last week I had granola every day, and now I'm paying big time. The blisters on my hands have swollen and multiplied and I can't even make a fist. I will be OK again in about a fortnight. 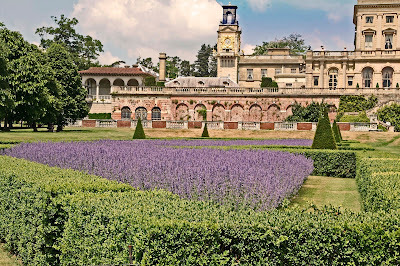 Cliveden in Berkshire is not too far from Helen and Dave and so we have been regular visitors over the years. It's a good venue for a family picnic. Although I've been there with family and also on a car launch, I still haven't seen it all. 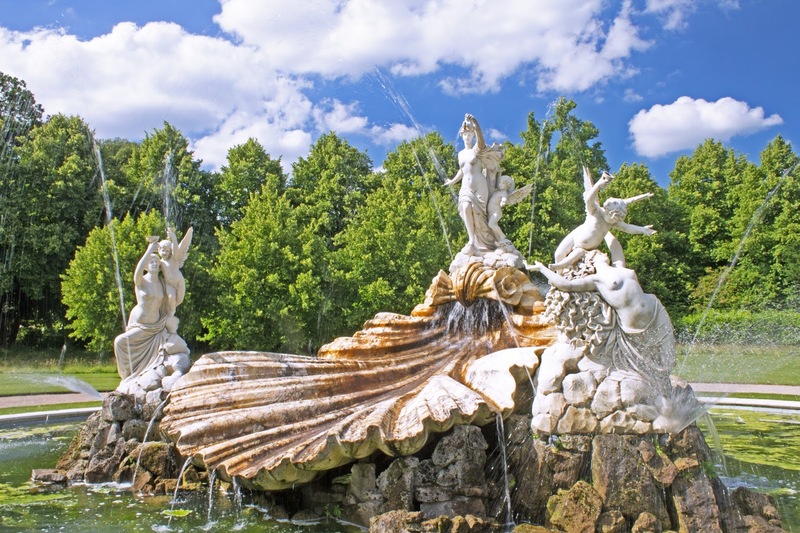 The first house was built at Cliveden (pronounced Klivden) was built in 1666 on a bank that stands high but runs down to the River Thames for the De Clyvedens. In 1795 there was a catastrophic fire and very little of the house was saved. It lay in ruins for around 30 years, but was bought by Sir George Warrender and he commissioned the architect William Burn to build the new house. After a short while the house passed into the hands of the Duke of Sutherland, who somehow managed to burn that house down as well. This time there was no lengthy delay and Charles Barry was commissioned to build a new stately home in the Italianate style. In 1893 the estate was bought by the mega-rich William Waldorf Astor. 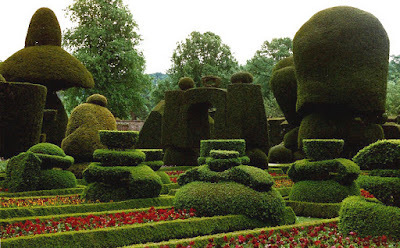 He made huge changes to the gardens and the interior of the house, but later became a recluse. Eventually the house passed to Waldorf and Nancy Astor, and all manner of fun began. For a long time Cliveden was the centre of high society, but it all came crashing down when the Profumo Affair brought the end of the Conservative Government in 1964. You can visit the grounds quite easily. The house is now operated as an hotel and you can stay there, for around £500 a night. There are 375 acres of grounds and gardens, which is why there are areas still to be explored. The only downside to today was that my hands were the worst they've been for about five years. On a scale of 1 to 10 (1 being perfect and 10 being please cut them off) I was a 9. It's my own fault. I've been careful to avoid gluten, wheat in particular, but wanted to know if I could tolerate oats. It seems that I can't! There were eighteen of us who met at the Bowling Green between ten and ten thirty. Luckily the weather was still being kind. I'd tailored the treasure hunt so everyone could get round in an hour. I let them all go and then tagged along at the rear. A few did it without help, but some would have been late if I hadn't brought them back on track. Afterwards we all enjoyed a late breakfast (brunch by the time we got it) and that was it for the day. I had an antihistamine tablet and it made me really drowsy, so I didn't achieve much else today. Abbots Ripton is a village in Cambridgeshire with a history that pre-dates the Norman invasion. 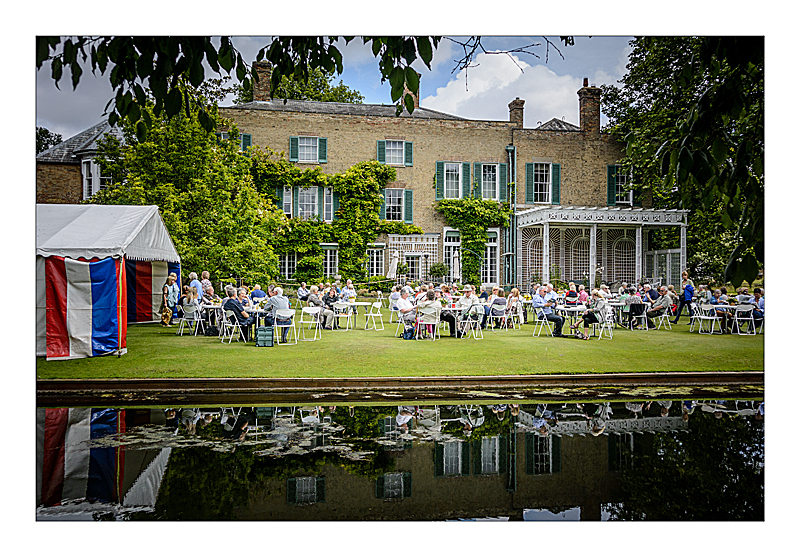 Abbots Ripton Hall, on the other hand, was built in the 18th century. The house and estate are owned by Lord and Lady Ramsay, and you have to be very patient if you want to see and know very much more. The estate itself has now grown to 5,700 acres, but the gardens and park cover 8 acres. 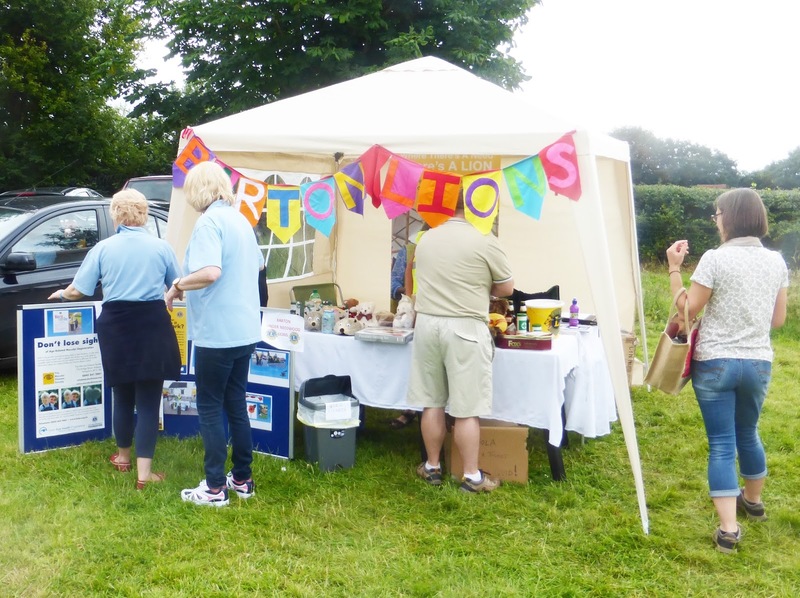 The Ramsays are quite altruistic and every other year they stage a grand garden party with the aim of raising funds for their various charities. When the garden show takes place, all of the gardens and park are there for the public to enjoy. The last show took place at the end of June, so keep an eye on their website to book up for 2018. Suddenly, after months where I seemed to have been pulled every which way, we are finding time for domesticity. I'm loving it. We didn't waste any time. It was pleasantly warm again and we both had another attack at the front garden. We made quite a lot of mess with clippings and cuttings. I took a car load to the tip, and then had to clean the inside of my car. I decided the lawnmower is as easy a way to hoover up leaves as anything, so I started. Half way through my lawnmower died. We made a trip to Wickes, found a mower at half price, and went home and finished. For good measure I did next door as well. They get back from holiday tomorrow and it's always nice to come home to a tidy lawn. Pauline went to church tonight and I prepared lamb kebabs with a quinoa salad (which Pauline made more complete on her return). We barbecued again and ate on the patio. It won't last but this week has been lovely. The only down side has been that my hands are bad again, the first time this bad for a couple of years at least. Still, I think I know what caused it, so no more granola. This place is something of a secret, unless you are planning a wedding. The house itself is not open to the public, but there ia a tea room that opens on a Sunday, and the gardens are open Sunday to Friday. 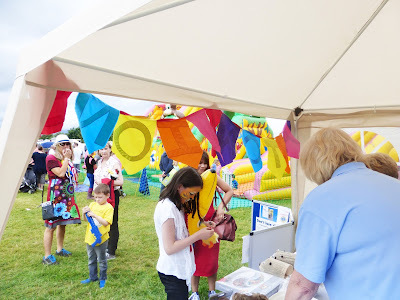 Saturday is when the four large marquees in the front fields are used for wedding receptions. Whatton House was originally built in 1802 for Edward Dawson and was bought by the first Lord Crawshaw in the 1870s when the Dawsons moved to Launde Abbey. Only a short time later a disastrous fire struck, leading to the house being almost entirely rebuilt in 1876. The reconstructed house had 26 bedrooms which housed an army of cooks, maids, butlers and footmen, but various alterations have been made to it over the years, including the demolition in the 1950s of a large part of the back of the house to adapt it for modern living without a large staff. 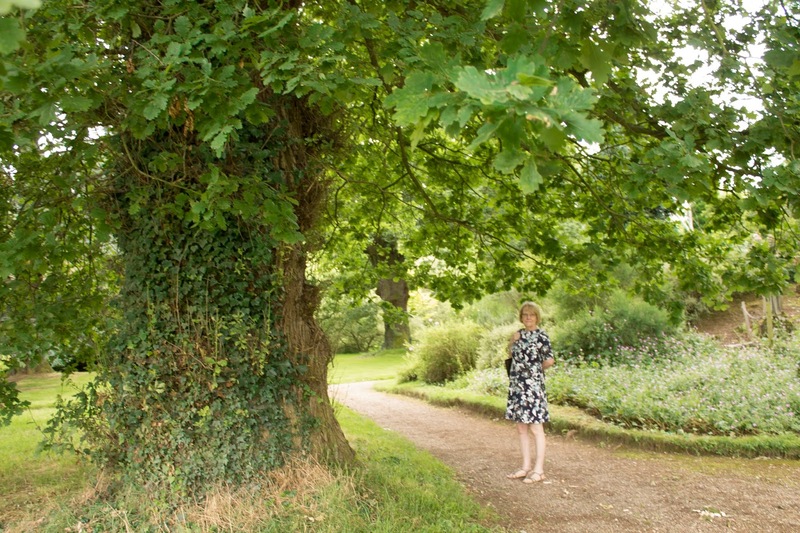 Unaffected by the fire, the stable yard and the walled garden date from 1802, and many of the trees in the park and gardens are also over 200 years old. During World War II the house was offered as a Maternity hospital by the then Lord Crawshaw and 2324 babies were born there, mostly to mothers who were evacuated from the bombing in London. It wasn’t as peaceful as had been hoped because several bombs were dropped in the area and a house was destroyed only half a mile away. On 10th February 1941 thirty incendiary bombs fell in the grounds. After the war the Crawshaws returned to Whatton House, and it remains their family home. It is currently occupied by the fifth Lord Crawshaw, David, his wife Belinda and family. 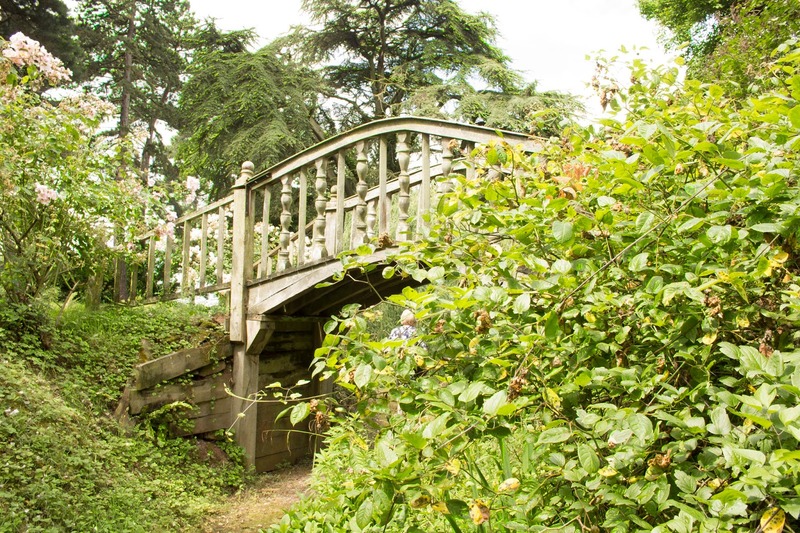 Whilst the house remains a private home to the Crawshaws and hence closed to the public, the gardens are simply not to be missed and we encourage you to come and share in their vibrancy and beauty! The house looked very uninviting as we drove off the A6 (from junction 24 of the M1) and up the long drive. As we got nearer we could see that there was scaffolding everywhere and the roof is obviously being replaced. We parked and made our way to the gardens. There was an honesty box at the entrance, the cost of which was £4 each. You walk through a little allotment and then out to a big surprise. The garden covers 15 acres and the trees certainly look a good 200 years old. There was one oak tree that looked far older than that. There was a rose garden and plant lined pathways, but the real beauty is deep amongst the trees. 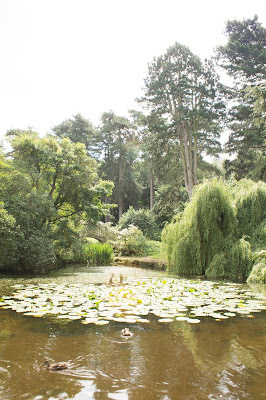 Two ponds offer colour, peace and life to plants and water birds, and it seemed clear that there would be colour whatever time of the year you visit. It was clearly going to be another nice day, so we decided on some 'Us' time. 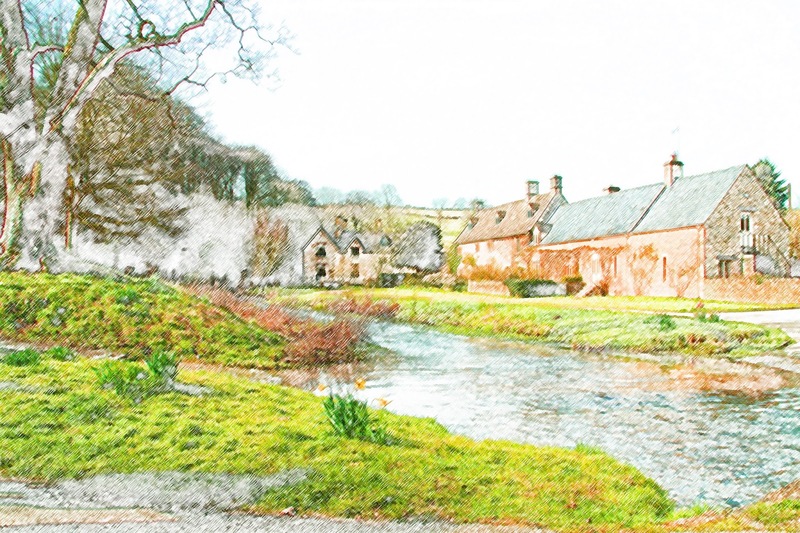 I suggested we go to Stoneywell in Leicester to see what changes there have been now that the National Trust have been in control for a while. Pauline said OK. I suggested we could go from there to the outlet centre in Mansfield and she was in the car before I finished the sentence. I've not been to Stoneywell from this direction, so I fed the post code into the Satnav and let it do the work. It didn't send me the way I expected but because the sun was shining and the countryside was so beautiful and the trees were shaking hands over the road, causing that lovely dappled patterns as you drove from light to shade, I just let it get on with it. When it said "You have arrived at your destination" we clearly hadn't. Stoneywell wasn't on the Places of Interest on the Satnav, but Whatton House & Gardens was, so we went there instead. We spent the afternoon at Mansfield, Pauline bought a new dress and I bought trousers. It was a round trip of just 100 miles. We are members of the National Trust, English Heritage, Royal Horticultural Society, and the Royal Society for the Protection of Birds. 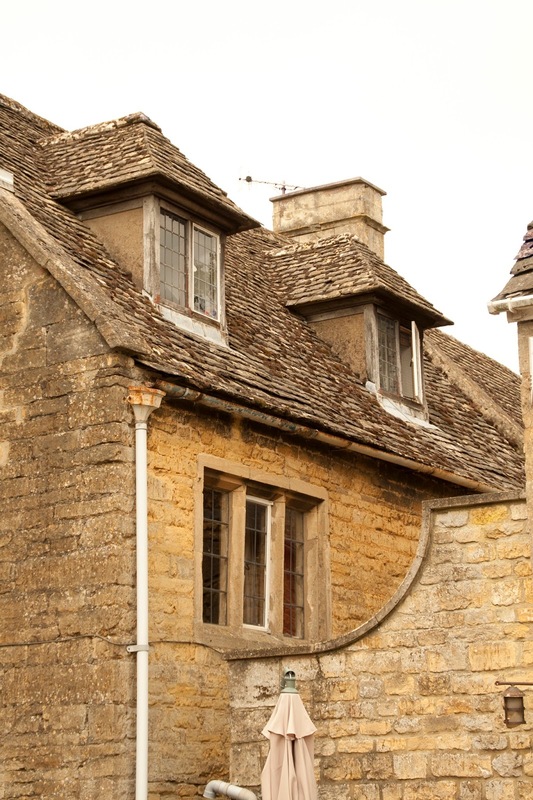 The main difference between the NT and EH is that building under the umbrella of EH are more likely to be important ruins rather that stately homes. That doesn't mean that they aren't as interesting, just that sometimes there isn't anywhere to get out of the rain. 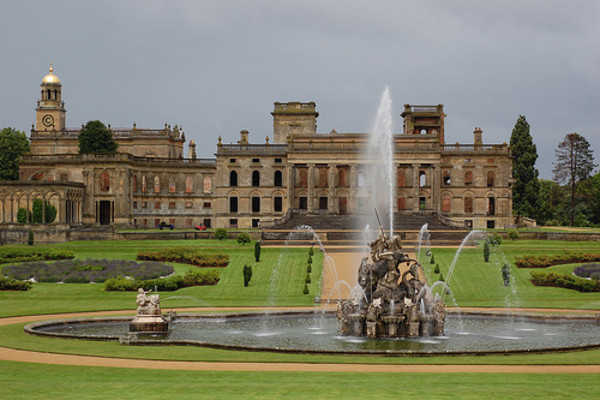 Witley Court (WR6 6JT) would have been prime material for the National Trust, but it burned down in 1937, and so now is a stately ruin. Witley Court was built on the site of an existing manor in 1655. It was expanded and enhanced over time and became a beautiful stately home set in 40 acres of park and gardens. Witley Court was another of those great houses that endured hardships and setbacks and the bankrupt owner sold everything of to the eventual Earl of Dudley in 1837. One name that is generally known and had strong connections was Edward Elgar. His father was commissioned to tune the pianos at Witley whilst Queen Adelaide was living there, and Elgar got to play a few recitals. English Heritage took over some seventy years after the calamity. Most of the restorations that have occurred since have been to the gardens, but despite being a ruin, Witley is certainly worth a visit. One day we will go back, this time with a better camera. This was just a normal Thursday - with heat. I am so pleased that the worst of the weather is skirting us by. I got up early and downloaded the magazines. Then I went to fetch Rita. Paul came over from Alrewas, so that was four of us in the kitchen Salon and Lisa weaved her magic. Looking more respectable and not the least light headed, I then recorded the Stevenage Talking News. The paper was not full of heavy stuff this week, so there was material to have a laugh with. I had three ladies to take to the Live at Home Scheme, one of whom was in the bathroom when I called. When she hadn't answered in three minutes, I left. Then she called to ask me to go back, which I did. She lives in Kennington Oval (a neighbour of Tony "Is this the way to Amarillo?" Christie. There is a secure gate system. She thought she had opened the gate remotely and so went off to wait for me. Ten minutes later she came to look to see where I was. I went to the studio and finished and duplicated Wales, Scotland and Stevenage, took the ladies back, bought the Lichfield Mercury, had some food with Pauline and was back at the studio for 6.30. We had a full team, everything went well and I was home for 9.30pm. 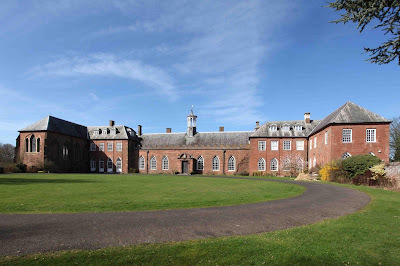 The Bishops of Worcester took over the manor house that was to become known as Hartlebury Castle in the early 13th century. With lots going on affecting the various religious factions, it was decided to fortify the building. This work was eventually completed by bishop Godfrey Giffard in 1268. 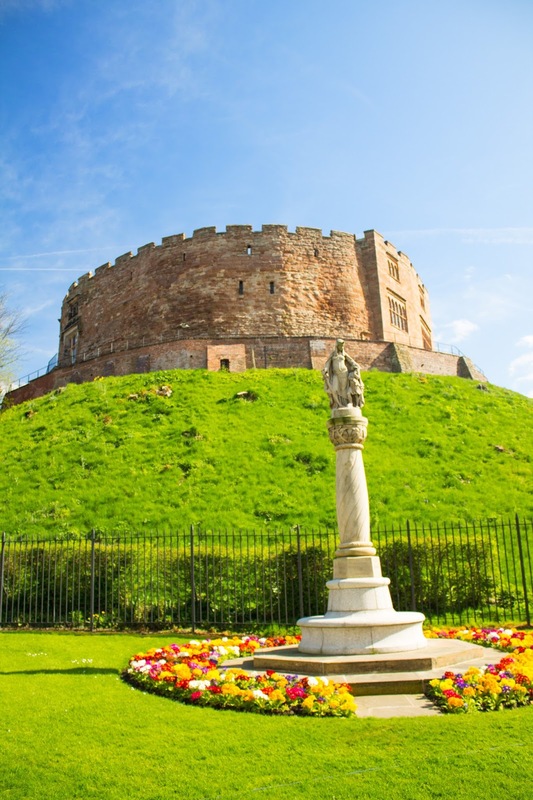 During the Civil War, in 1646, the castle was well protected and defended, but the local commander surrendered any way. This led to the building being confiscated and sold off to Thomas Westrowe. However, it was returned to the Bishop of Worcester during the Restoration. 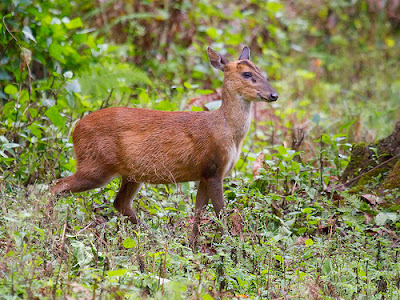 The land had been a deer park for all of known history, but the deer were gifted to Queen Victoria. The castle was moated, but most of these were filled in to create beautiful flower gardens. Bishops lived at the castle until 2008. The church decided to sell the castle. Local people were greatly concerned that it would be sold to foreign concerns and over the next few years the Hartlebury Castle Preservation Trust applied everywhere for funding and eventually raised enough to meet the £2.45m asking price. 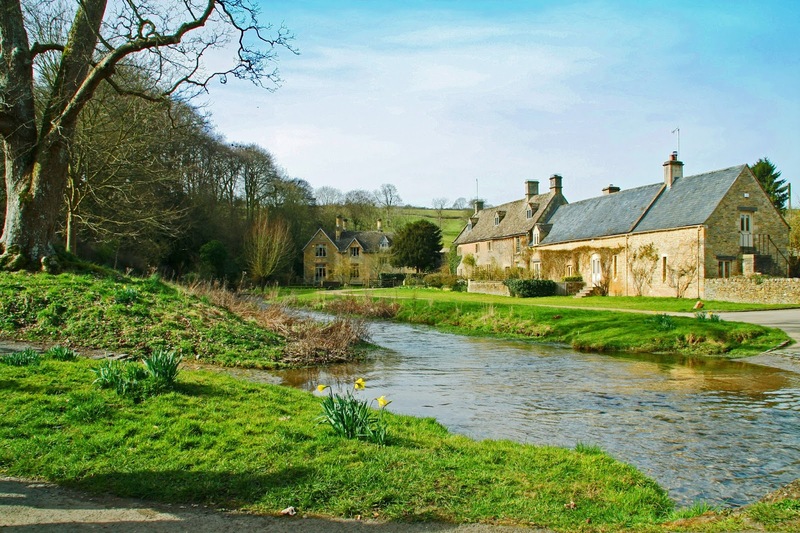 More funding has since been raised and a programme of restoration is now underway. This has restricted visits and tours, but not entirely, so if you are in the area, (DY11 7XZ), it would be worth asking about a visit. Another hot day. No complaints from me. There was a severe weather warning but we got the very fringe of it. So, a few large dollops of rain for ten minutes. I had the 8 sacks of cuttings to take to the tip and I was there just as it opened. From there I went and collected six sacks of returns from the Sorting Office. Pauline was getting ready for this afternoon, but I'd allowed for that, which is why I started early. I worked on the patio and had processed all of the returns by 12.30. Louise, Molly and Rita arrived ten minutes later. Molly is lovely. Now five months old she is more aware and shows a very equanimitable character. We sat on the now vacant patio, under the shadow of the brolly and enjoyed a very nice butternut squash salad. I bought a new video camera today. My intention is that when we make visits to places of interest I also do a twirl with the camera, as well as my still shots. The instructions are in Chinese so it might take a while to master. The first time I went to Malvern in earnest was to visit the factory of the famous Morgan sports cars. The visit had been a delight. I did quite a few factory visits in my time in the automotive industry, but the only factory that came close to Morgan was the old Aston Martin plant at Newport Pagnell. In both plants there was an ownership of the vehicles built. By that I mean, when we were at Morgan a low loader arrived and delivered a Morgan car. As it was brought into the plant someone called "Tell Albert there's one of his just come in." The visit had been in the morning, so it seemed a crime to waste the afternoon and not explore the locale. 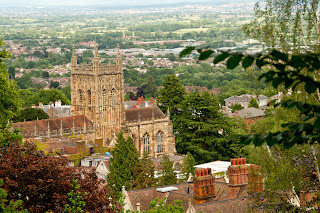 Malvern is a spa town and includes Great and Lower Malvern. It sits in the shadow of the Malvern Hills. Climbing to the top offers you great views, and if you are on Worcestershire Beacon you can actually look down on the living street plan and get a beautiful view of the Great Malvern Priory. The history of the priory goes back a long way. 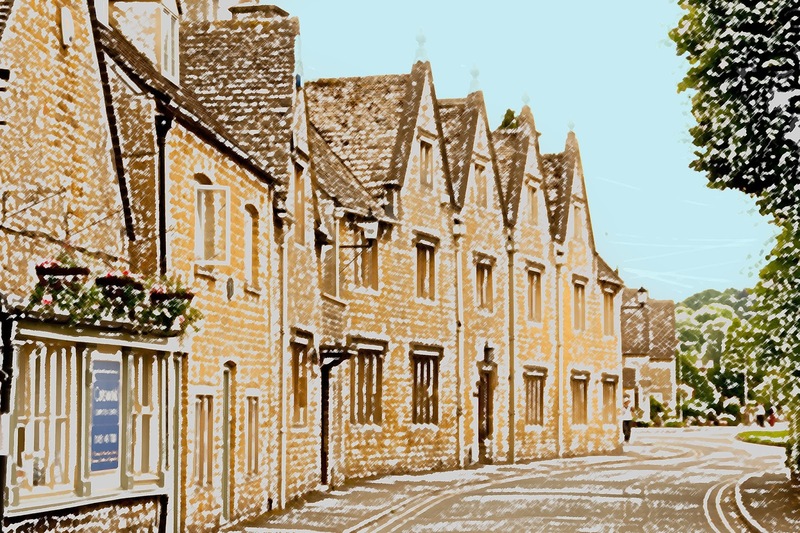 There was a building there long before the hermit Aldwyn was persuaded to become the first Prior, and he began building and upgrading in 1085. Things trundled along until the dissolution of the monasteries. Rather than let the building fall into decay, the local people raised the princely sum of £20 and bought the priory to replace their ancient church. It operated as a church thereafter. It did begin to suffer from neglect throughout the 18th century, but in the early 1800s there were efforts made to effect repairs. These weren't altogether successful but in 1860 the work was tackled in a more meaningful manner and the priory was saved, albeit as a church. The hottest day of the year so far. It touched 33 here in the Midlands, hotter in the south east. I got myself sorted and then headed over to Rugeley for what was going to be half a day with the Staffordshire Neurological Alliance, but there were several notable, though unavoidable, absentees. The morning was scheduled to belong to our potential advocates, but really only two came, plus a young lady from St Giles Hospice. John Morgan gave chapter and verse about the SNA, where it came from and what we hope to achieve. We don't have anyone else who could do that. I thought the meeting went well. We had a very pleasant lunch and decided to start the monthly meeting early. Because of what went on this morning, we had covered half of the agenda, and so we were done and dusted for 2pm. Back home and an hour or so in the shade with our books, and then out first barbecue of the year. I hope we do better than last year when we stopped at one. They say if you go to Croome you should also go to Hanbury Hall, and the implication is that this is a happy visit, but it wasn't always so. For a long time the inhabitants suffered bad marriages, poor health, and even a suicide. The hall was built by Thomas Vernon. 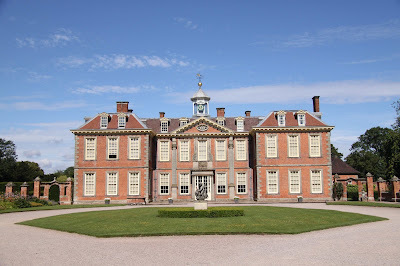 His family had been slowly accumulating land in Worcestershire since 1630, but it was Vernon's wealth that saw the house built in the Queen Anne style in 1706. However, some anomalies in style suggest that a start was made a few years earlier and designs were changed along the way. The original building had a large hall surrounded by many small rooms. When Henry Cecil married into the family and moved in, in 1776, he effected some major changes and many of the smaller room were morphed into larger ones. The marriage of Henry Cecil, 1st Marquess of Exeter, was not successful and ended in divorce, which resulted in the house being empty from 1791 to 1840. Subsequent occupants fared little better. Broken marriages ensued and then changes in agricultural policy severely affected income and in 1940 Sir George Vernon committed suicide, and the house had no more claimants. Eventually it came under the control of the National Trust and there has been a programme of steady improvements and revival, making it - at last - a happy place to visit, at WR9 7EA, plus the gardens are worth a visit in their own right. After what seems an interminably long time I seem to be getting my life back. There's suddenly time for the house and, more importantly, time for us. It was hot today, creeping up to 29. We spent the morning on the outside wall, which meant we were out of the sun. We filled 8 sacks with what we cut back, and that took us to just over half way down the wall. Very little grows under our three big trees, but something might now stand a chance. That took the morning. We had some chicken left over from yesterday, and wouldn't be eating till late for us, so we had a simple chicken salad for lunch. Balsamic dressing for the greens and mayonnaise for the chicken. Pauline then took Rita to the knitting club and I did the pool. John Cassie came for us at 7pm and we were off to Tamworth Lions Handover and 40th Birthday. This was a 3 course meal at the Castle Hotel. I would say in the shade of the castle itself except the castle isn't any bigger than a two storey building. 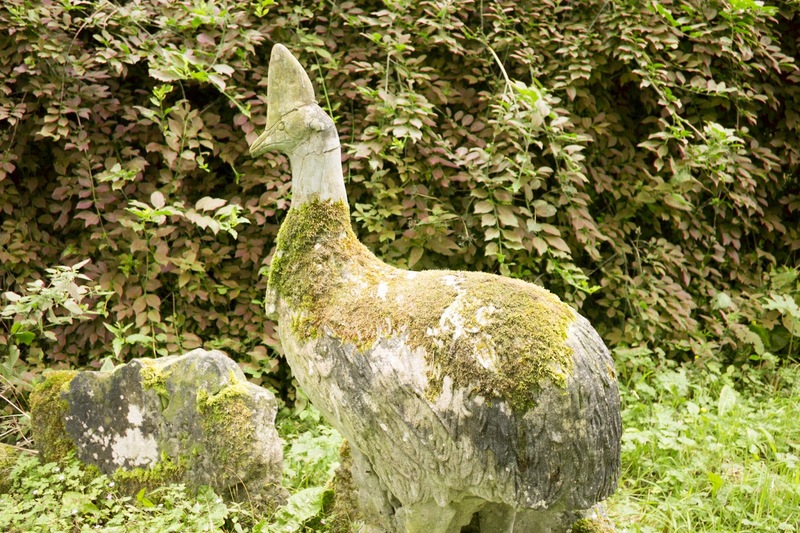 It was never invaded, but only people less than 2 feet tall would have had difficulty scaling those outer walls. I was going to leave this venue until I start on Devon and Cornwall proper, but an article in The Times today cited it as one of three places in Britain that deserves footfall, but doesn't get it. Most of these places warrant multiple visits because in this day and age, if you don't constantly keep making improvements, you rapidly fade away. 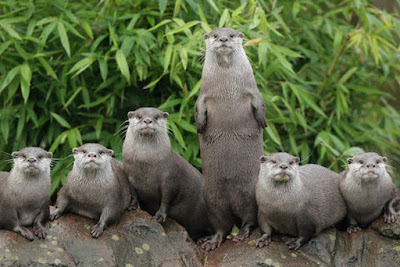 Situated in the countryside not far from Launceston at PL15 8GW, we visited the Otter Centre whilst on holiday at Rock. It is probable that the otter is what draws most visitors, especially given that they were a friendly and lively feature of our rivers in my younger days, but are now missing almost everywhere, but there is a lot more to see and countryside to explore. Situated in a little valley with lots of woodland and two lakes, the wildlife centre guarantees a show by the otters, who charm everyone, especially the young, because their antics are lively and some of their actions are almost human. I have frequently seen otters 'kiss' their young, holding their heads and plonking one on them. The centre has several verities of otter. There are other animals to see, including meerkats, harvest mice, chipmunks, polecat and deer, especially Fallow Deer and the tiny Muntjac. You can also wander the woodland trails, but this is also a great location for anyone interested in bird watching. The lakes have quite a number of waterfowl and there are all manner of ducks and geese. At last. 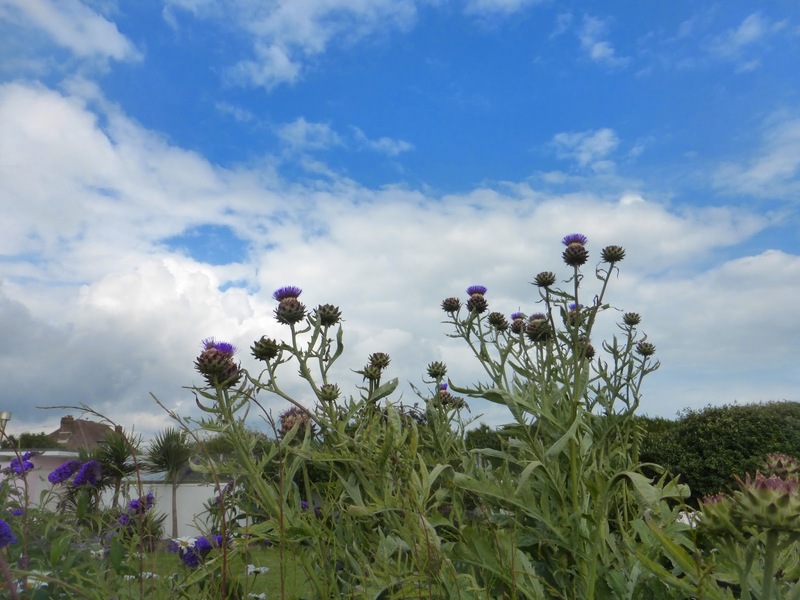 Hot weather, and it's likely to last almost three days! When I say hot, my brother Barry would put a fleece on if it's only 24 degrees, but when it has been no more than 16 for more than a week, a sudden rise of 8 degrees is really noticeable. 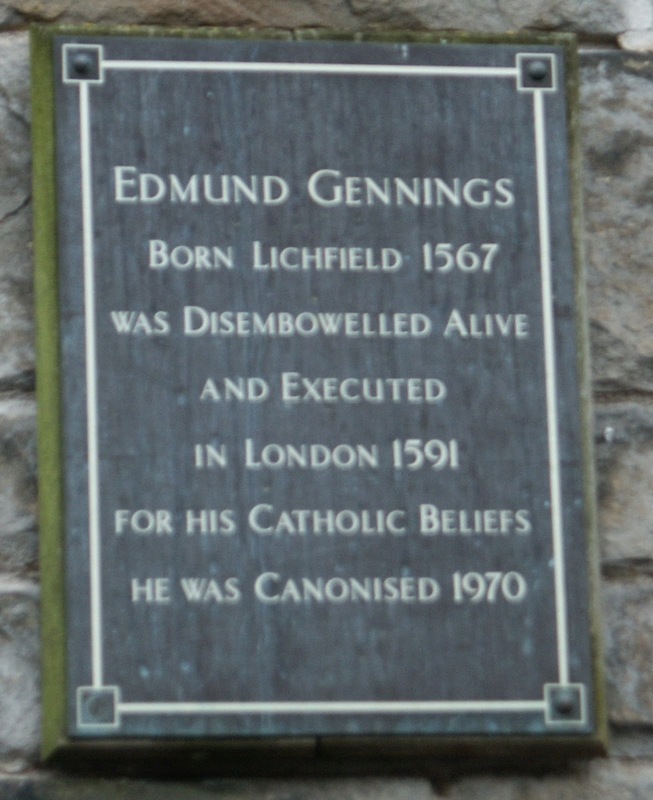 I went into Lichfield before the shops opened and was surprised at how many people there were in the town. The sun had brought everything out. I had been asked to do a treasure hunt for a social event next week and I wanted to check what is still there, and even if anything new has been added. 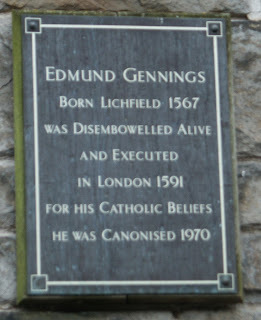 I have never been anywhere where there is more information on the walls of a town than Lichfield. You don't have to go far without finding someone was born half way up a wall, or someone lost more than their breakfast for upsetting the powers that be. One new plaque is on the wall of The George Hotel, and it commemorates the 1911 flight that ended in Lichfield. That's quite a coincidence, seeing that I mentioned it just a few days ago. 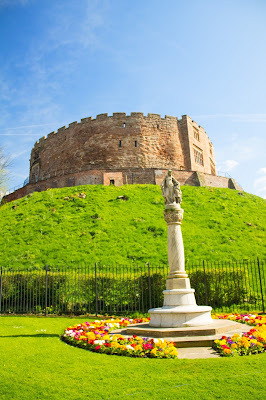 There is quite a lot of history in Lichfield and when the treasure hunt is over I will feature some of the clues so that readers can see what they are missing if they don't come to this warm little cathedral city. Pauline took Rita to church. By the time they got back I had mowed both lawns. After lunch I took the shears to anything overhanging and cut down enough to warrant a trip to the tip. There will be more to follow. Twenty years ago, this would not have been a place to visit. Today it is a delight. The park and home were owned by the Earls of Coventry for centuries. 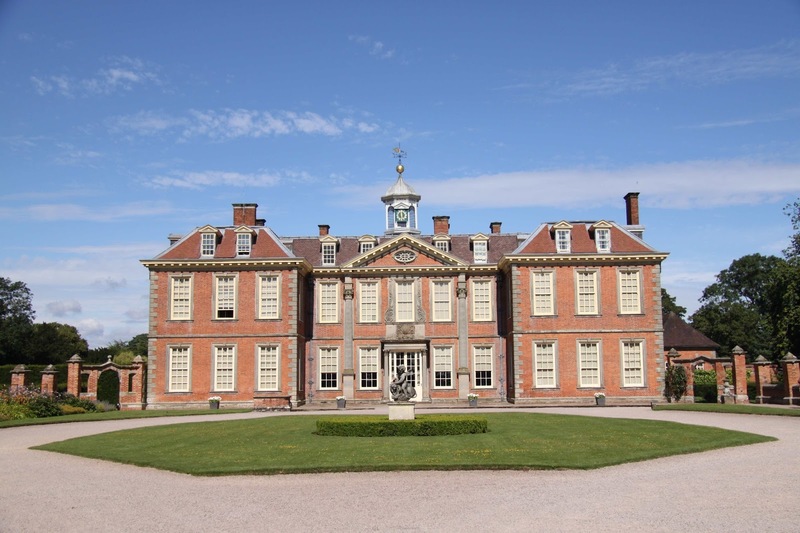 The origins of this neo-Palladian style stately home were laid down in 1640, but it was in 1751 when George Coventry (6th Earl) called in Capability Brown to not only design the gardens, but the house as well. 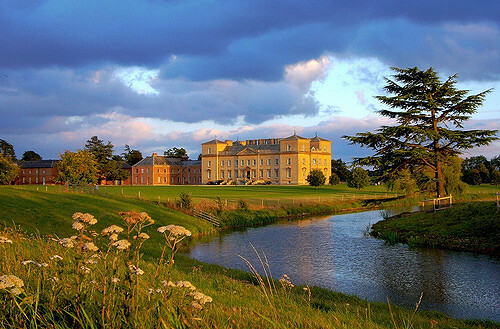 Tenures don't often last more than a few centuries and Croome Court was sold to the Roman Catholic Archdiocese of Birmingham in 1948 and it was run as a special school until 1979. Next came another religious group - the Society for Krishna Consciousness, and they lasted five years until they ran out of money. The house was then allowed to languish. There had been chequered moments in its history, but it had survived those, but now it needed intervention that was maybe a little less divine. 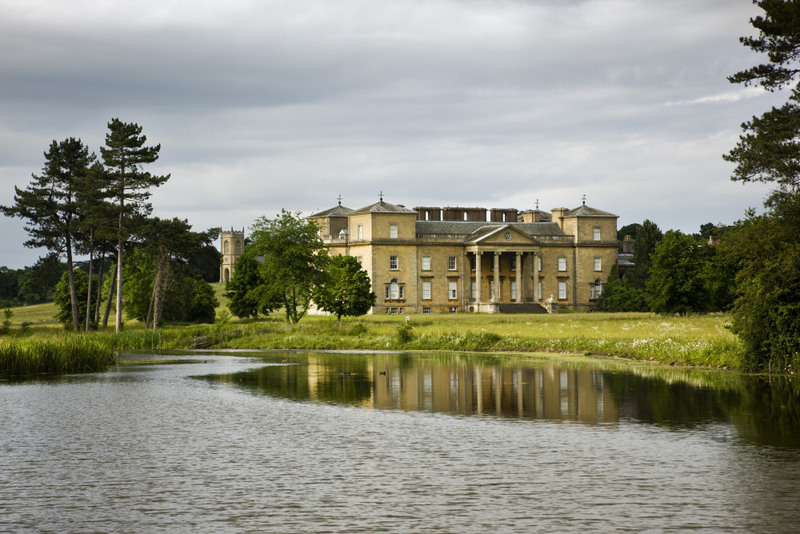 In 2007 the ownership of the house passed to the Croome Heritage Trust. They leased it out to the National Trust, and the job began of renovating the main rooms. Some £400,000 later there were six rooms that could be opened to the public. 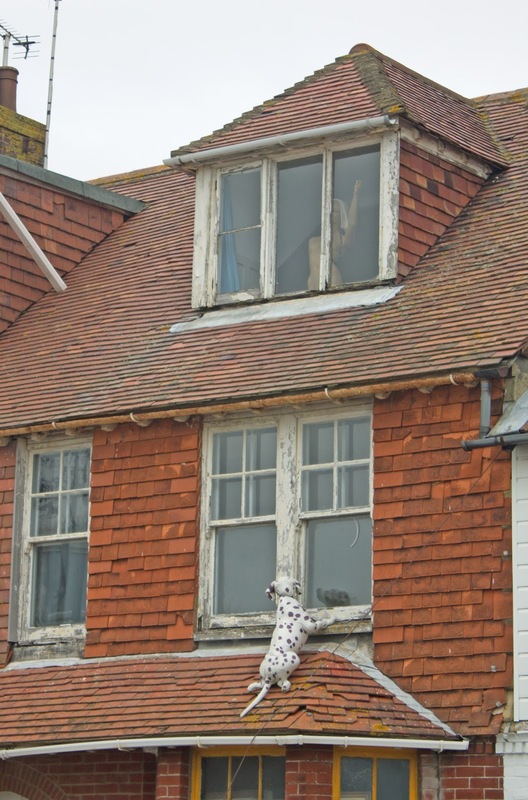 The NT said that £4.8 million would be needed to put the house back to its former state of glory. Enough influential people became interested, to the extent that the money was raised and the repairs are now complete. So if you are in Worcestershire, don't hesitate to visit Croome. The forecast was not good, there was early drizzle, and so the clover continues to thrive where there should be none. Maybe tomorrow. Pauline had a task for me. It should be explained that I am not a practical person. That's why you have grandchildren, but they are all too far away, and so it was down to me. Helen had made Pauline a Roman Blind for the kitchen, and it needed to be put in place - properly! So I figured I ought to get up and do what would obviously take all morning. To my surprise, I finished in about an hour, and I'd done the job properly. I won't be making a living out of it, but I won't be too concerned if asked to do another. I next went to visit a listener who couldn't make her Talking News work. Her daughter warned me she was getting grumpy, but it was all laughs whilst I was there. I told her I'd dealt with championship standard grumpiness and she didn't scare me. This afternoon John Whitehouse collected me and we went up to Alrewas, which is 5 miles or 10 minutes away. We were there to help Barton under Needwood Lions with their tombola stall. 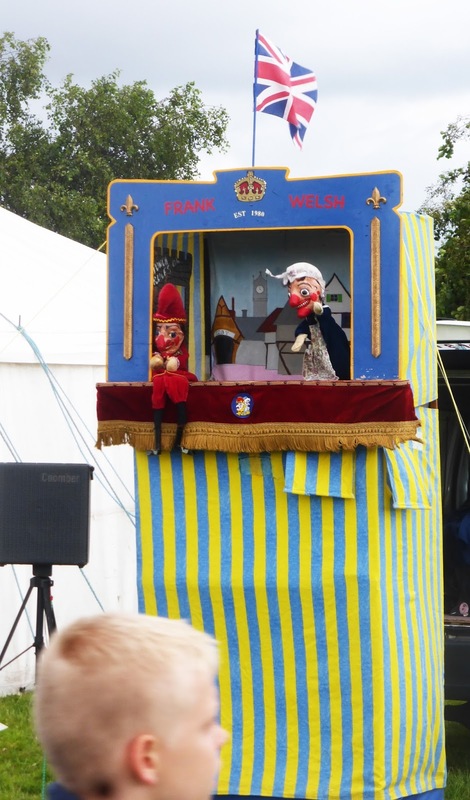 Lichfield Lions used to do similar until a few years ago, but the practise had died because the show didn't have much substance and very little appeal. The first thing that struck me was that the car park was full and the overflow had very little room, and that was twice as big as the car park. When we got into the field it was clear that this is a country show that has really grown, in size and popularity. 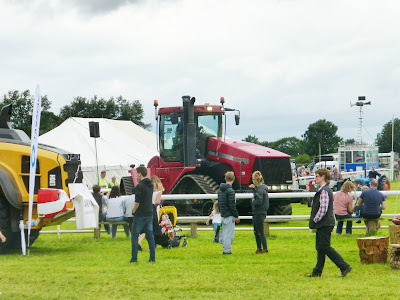 The show is held in a big field on the edge of the village. 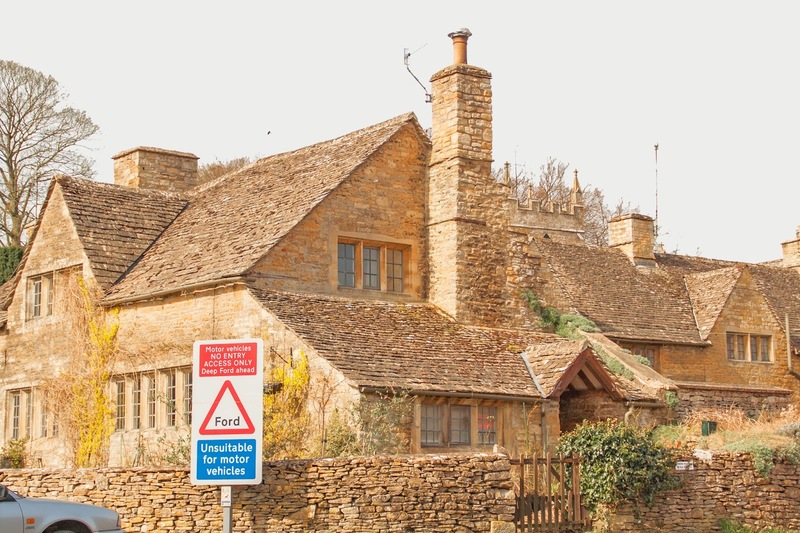 It is typically rural, and quite old fashioned in many respects. There were a few dozen vintage cars, an impressive display of ancient agricultural vehicles, a Punch & Judy stall, and dozens of stalls, some of them quite interesting. 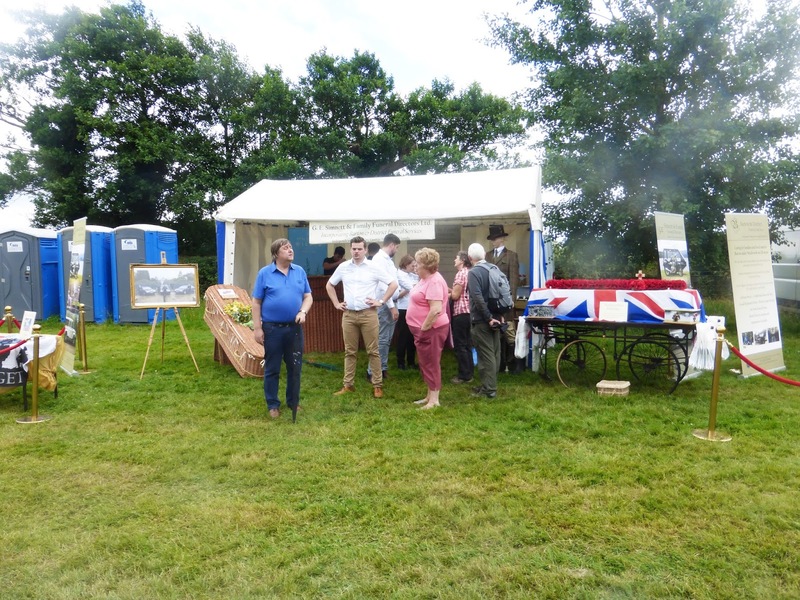 The fox hounds were trundled out but probably the most surprising stall was that of the local undertaker who was there with a selection of caskets, in particular an ecologically friendly wicker one. We sold out. Never known that before. Peter Jones is a natural salesman and kept a steady stream of punters coming to the stall, especially after he heard me call out "Every winner gets a prize." That became his mantra for the afternoon and it brought a few smiles and plenty of participants. From there we went to the Fradley Arms for a convivial meal. There were eleven of us, because Pauline came up for the meal. She hadn't met some of the Barton crew and spent lots of time talking and getting to know them. The meal wasn't that great, and Judi and Jilly complained that their pudding course hadn't arrived and everyone else had finished, but they were happy enough when they were given a bottle of wine each to go home with.